We chose to have a quiet family Thanksgiving this year just the 4 of us. Maybe next year we will do the whole big thing with friends, but this year we felt the need to circle the wagons. I made reservations at Restaurante Don Colon in the Coronel Hotel. Don Colon is an Ecuadorian who lived in Naples, Florida for several years and he was serving a traditional U.S. Thanksgiving meal. It was actually quite good except it could have been a bit warmer. We had turkey with stuffing and gravy, garlic bread, sweet potato, carrots and green beans, and cranberry sauce that we suspect was actually mora(blackberry). Dessert was apple pie that I didn't care for at all. While eating, both the local paper, El Tiempo, and the local news station came in and took pictures and interviewed the guests and Don Colon. It was pretty funny. After dinner we walked to San Blas and got MORE dessert. Ice cream! Mixx has the best gourmet ice cream in town. It is really good. I try not to leave my camera at home for reasons like this. paper that were flying around. I have no idea why. The weather had been just beautiful lately. I haven't been caught in a torrential downpour in a week or so. lol We went for a walk on Sunday down by the Tomebamba. I'm glad I brought my umbrella. That sun is brutal. days, but the pictures don't do them justice. We finally got our car! Yeah!!! It is in the shop right now getting all checked over and the suspension fixed. We should have it back today or tomorrow. On Friday we are going to Paute to see the farm of a yahoo group friend, Vladimir. It will be nice to go exploring again. Since we have turned away from the creamery idea and have let our minds start to drift away from that frenzy I have become much more relaxed. I am exercising every day in the morning and taking cat naps when I need it to keep my chronic fatigue at bay. I can feel myself starting to slow down and enjoy where I am. To live in the moment. My jaw tenses up and hurts only once in awhile. (I suffered from horrible TMJ and bruxism due to job stress.) The weather is just gorgeous and that is a balm to the soul. My nails have never been this hard nor have grown this long. I have already had to cut them twice and they are due for another cutting. Must be all the Vitamin D. I am feeling more comfortable in the city and the language is coming easier as long as the person is speaking slow enough. I am not feeling like a complete stranger, but more as if I belong here. It is nice to finally feel at home. Thanksgiving is tomorrow and I have plenty to be thankful for. Family and friends, all the time in the world to spend with my children, and the blessings of a new country. We are going to have dinner at Don Colon restaurant just the four of us. It will be nice to give thanks as a family, but we will also be thinking of our family back in the states and missing them. The Tortorillas property had the same problem. There is no servicable road. We had to stop the car about 1/2 a mile away and hoof it in. The views were spectacular and we were feeling pretty good about it. We met and talked with the nephew of the owner. Turns out that another uncle owns 2 hectares smack dab in the middle. That didn't bother me so much since there were other places to build a house and out buildings. Two or three actually. It is really hard to tell where property ends and begins in the mountains, so we really wanted to see a plat map. The little school down below in the valley was only a 10 min. walk away. While dily dalying on the property it started to rain and then turned into a huge thunderstorm with thunder, lightening and a pouring rain. The kids and I had our raincoats, but Mark and Marcelo only had their shirts. The rain hit the trail and turned it into a red mudslide that was almost all uphill. It was quite an adventure for awhile. Mark and I had to each take a child and help them up the hills. When we finally got to the car we were sweating, completely drenched from head to toe and full of mud. It stopped raining when we reached the car. Go figure, but that is weather for you in Ecuador. be a nice place to build a house. Here come the clouds. That property is 6 hectares as well and is being offered for $55 we think. Couldn't get a firm price on it. So here's when the soul searching began. Mark really liked it and started thinking of ways we could divide it and split with others. The price is too high for us, but we do have some other people interested in possibly splitting land with us. But then there is also the cost of putting in the road and getting the machinery in there. It started to become very overwhelming for me. We would be investing ALL of our money in this venture and still not have enough to get the creamery fully up and running. I kept seeing problem after problem occuring, beginning with the road, and not having the money to get where we want to be. I've been there before and I didn't want to go back to that place. Mark had already recognized that in order for us to grow the business enough to meet the demands we would need to take on investors, and that scared the crap out of me as well. I don't know why I am so freaked out about it, but the idea of involving others in this before it has even taken shape does not feel good to me. There is the small fact that I have only made a few fresh cheeses and I really have no idea what I'm doing yet. I had always had the idea to get the goats and begin making small batches of cheese for our family and friends. THEN, if I enjoyed doing it and IF my cheese was good I would think about making more and selling small batches. Once this idea of a creamery hit us it was like a freight train that I couldn't catch. I loved the idea of it, but I didn't know if I really wanted to tie myself down to a business that would need all of my time and energy when I was just starting to get used to the idea of slowing down and enjoying life. So, I told Mark I didn't want to do it. After a lot of round and round, discussion and more discussion we have decided to look for a amall piece of property(one or two hectares) with a small, nice house on it for cheap. Then we would like to save our money and travel. We also tossed around the idea of taking yearly sabbaticals in South America and Europe, but even though the kids want to travel that might be hard on them. Plus, we wouldn't have a car and I really don't want to live in the cities. So, we decided to buy in Ecuador and use it as our home base. 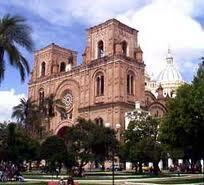 In the meantime while we save our money we are going to explore Ecuador. 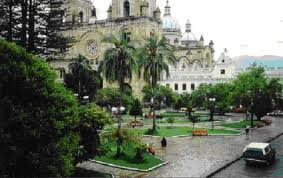 In a couple of weeks we are going to take a week to go to Ingapirca, Latacunga and Ambato, then head to Banos to see the town and Tungurahua. 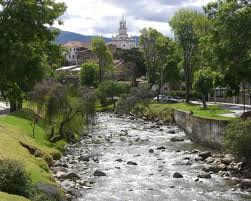 After that we are going to head to Otavalo and San Pablo del Lago. We know a woman in Banos and she has invited us to see her property there. There is also another expat family from Germany and they have a lodge in San Pablo del Lago so we will stop by and say hi to them as well. We were going to go up last week and tried to rent a car, but the rental companies will only accept a credit card and all we have is a debit car. I almost forgot to mention that after a nice hot, sweaty day looking for cars on my birthday we did actually go out for dinner the next night with friends and their children. I have never been to Tiestos and I was waiting for a special occasion to go. The food and service were amazing! Chelsea and Brian know Juan Carlos, the owner, so they asked him what he recommended. He asked everyone their likes and dislikes, counted how many adults and children and then made our plates to order. For the adults we had surf and turf, langostinos in a yummy sauce and lomo fino two different ways. The kids had a chicken dish in a tomato sauce. The tiestos came with potatoes, rice, quinoa, salad, and bread. Everything was delicious. For dessert the children got ice cream, but the adults shared three dishes. Some kind of praline and caramel cake, chocolate mousse with maracuya ice cream (my favorite) and rum flavored ice cream with nuts. It was the best meal I have had in Ecuador. I am already ready to go back. Whose birthday is coming up??? Our good friend, Aaron Williams, opened up a CrossFit Gym this week in Cuenca. According to his website, The Zone, (http://thezonecuenca.com/) Crossfit increases power, strength, cardiovascular and respiratory endurance, flexibility, stamina, coordination, agility, balance, and coordination. Sounds like all of the things I will need to work on our farm. Just about everyone I have talked to has lost some kind of weight after only a few months in Ecuador. Even my 9 year old son has lost 5 lbs. But me? Nothing. Not one single pound. In fact, I have gained 3. So depressing. That was one of the things I was looking forward to when moving here. All I heard while we were still in the states was how the weight would just fall off. Yeah, right! I've even given up fresh fruit thinking the sugar was causing me to be at a standstill. That just about broke my heart. It was all I could think about before moving here...being able to buy and consume fresh, fresh, fresh fruit. But even that did not affect my weight loss, so smoothies are back on the menu. My mom says it may be my age and hormone fluxuations. I am 45 soon to be 46 this month. I also think it may be due to a change in my lifestyle. Yes, I am walking a lot, but I was on my feet almost all day while teaching in Cleveland. Here I am reading a lot and loving it, but of course I am sitting down. Back in Ohio I had chores to do. Mucking stalls, feeding animals, hauling hay, hauling water buckets, moving animals, etc... Here there are no chores to do. Just a lot of walking to and fro. And once we buy a car even that will be reduced. So, I am really hoping this CrossFit stuff works. I'm not looking forward to getting up early and getting there by 6:00a.m., but I am also not happy about the way things have been going. Something must be done. CrossFit, here I come! That is how Mark has been lately. Like a bear. He is antsy and anxious and wants to have some freedom to get out of Dodge. So, today we went and looked at a new car. We have been bouncing around the idea of purchasing a car for about a month now. We began to feel some pressure once we started looking at properties. Riding in the back of squishy cars or in the bed of a pick-up is getting old. The question was whether we should just get a beater right now that would be Mark's car eventually after we purchased the family car later on or should we invest in the family car now, and if so should it be used or new? Cars are super expensive in Ecuador since they are imported. This is a big decision. We started looking at used beater cars, in particular the Lada Niva. It is a Russian car and supposed to be built like a tank. They are all over the city, so clearly they are liked by Ecuadorians. We found one for $5,000. It had over 200,000 kilometers on it. Yikes! The guys popped the hood so Mark could inspect the engine, but then couldn't get it down. And it smelled like a smoker's car. Yuck. Anything in our beater price range is extremely old with thousands of km on it, and they are hard to find. It has been a pretty depressing search. For our family car we want to get an extended cab pick-up for the farm. It has to be utilitarian, but also comfortable for long rides. F150's and the like are upwards of $40,000 plus they are big and hard to manuever in the city. We considered and are still considering a used pick-up, but today we headed out to the Mahindra dealership to look at their trucks. We looked at a 4 wheel drive turbo diesel. We took it for a test drive and I was impressed with its pick up and the back seat, which was very comfortable and could easily seat three or four smaller peeps. It climbed a very steep and muddy hill like a champ. So, we will compare with some used Chevys and then make a decision. It will be so nice to just get out of town when we want to and go and explore when the mood hits us.